If Junior Brown were going to record a live album anywhere, it may as well be at the Continental Club in Austin, TX; Brown played a five-year Sunay night residency there in the 1990s that helped launch the maverick picker into the national limelight, and if there was ever a town made to embrace Brown's wild fusion of country, rock, surf, jazz, and anything else that could make its way through his fingers onto his "guit-steel," it's the Texas capitol that's also one of America's greatest cities for all sorts of live music. 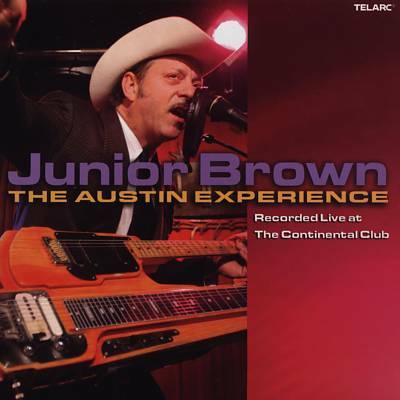 Brown and his band made their way back to their old stomping grounds for a two-day recording party in April 2005; 52 minutes' worth of the results are collected on Live at the Continental Club: The Austin Experience, and this disc captures Junior in typically dazzling form on his "guit-steel." Brown is a casually masterful picker who can seemingly excel in any style he chooses, and from the fast-stepping honky tonk of "I Hung It Up," the instrumental rock showcase of the closing medley, and the norteño stylings of "Juan Charasquado" (with the great Flaco Jimenez sitting in on squeeze box), Brown burns with flash and melodic substance from front to back on this disc. This guy knows how to deliver the goods, and the wildly enthusiastic crowd here didn't need to be enhanced for this release -- this was obviously a show worth seeing, and the results are manna from heaven for guitar freaks. If this album has a flaw, it's that Brown appears to have the not unknown Achilles' heel of not singing and playing especially well at the same time; while his guitar work is sterling throughout, the first half of the album finds Brown sounding just a shade flat in the vocal department. But if you're a fan, chances are you come to hear Junior play more than sing, and on that scale The Austin Experience thoroughly satisfies.